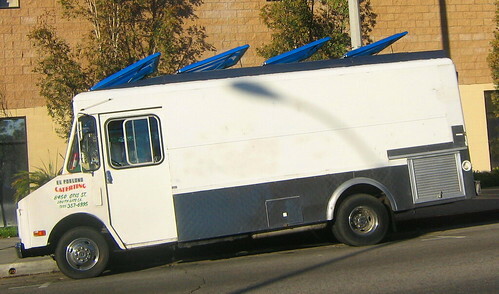 El Poblano is a cemita poblana truck that parks at the corner of Fairfax and Pico weekdays from 11-4pm. 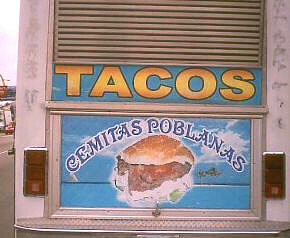 The cemita poblana milanesa is the truck specialty but they also serve tacos. They were out of al pastor so I went with carnitas and carne asada. I was pleasantly surprised by the quality of the meat at El Poblano. Ever since the Tacos Kimberly incident I approach some trucks with the "please dont kill me" mindset. I know it's ridiculous but I still have bad flashbacks. But the meats here were tasty and juicy and the tacos well prepared. The carnitas had a salted punch to it and the asada a peppery aftertaste. There wasn't alot of salsa on the asada taco so I just wrapped the jalapeno into the taco and went for it. This made quick use of my orange jarritos and I started to regret this decision about two thirds in to it but it was damn good. Both tacos could have used more salsa though. Part of that is on me for not asking for some extra on the side but I always like when the taquero ladles an ample amount of salsa on the taco so I don't have to ask for extra. I got curious so I ordered a cemita poblana de milanesa for the road. My sandwhich came on a sesame domed roll with a cut of beef that was pounded thin, breaded and fried and then topped with panela cheese, slices of avocado, onion and a chipotle chile. Sabroso! The sandwhich was quite tasty at first but the further I got into it the dryness started to affect the taste. The cemita roll is very bready and there wasn't anything saucy of any kind to counter the breadyness. I'm not a cemita poblana expert so I'm not sure if it's customary for this sandwhich not to have some kind of mayonaise spread or salsa. It could have used something though. The cemita poblana is a regional variant on the standard torta. 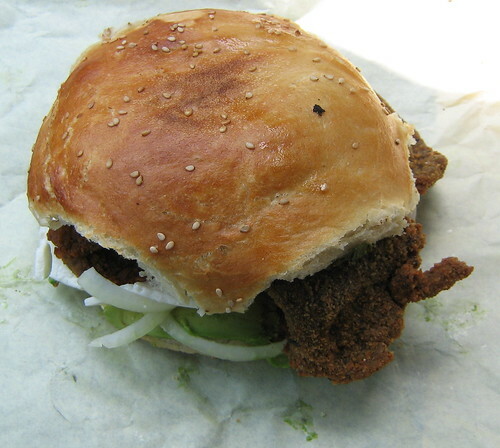 Most tortas have mayonnaise to counteract the breadiness you mentioned. i had that when i was traveling with friends to zacatecas, juarez to be exact. when i had it they put some kind of thick tomato salsa on it and but it was like eating beef jerky sandwich I like it. 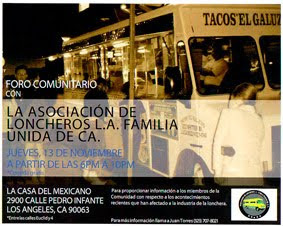 Pico and Fairfax?!? Perfect, I can walk there from my casita!!! Thanks for the recommendation, Bandini. where is this wonder? 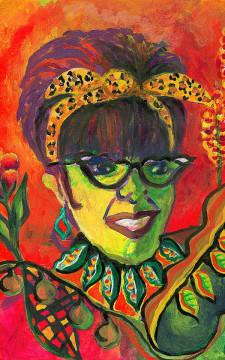 I rode by Fairfax and Pico today, and saw nada. How do I know all of this? 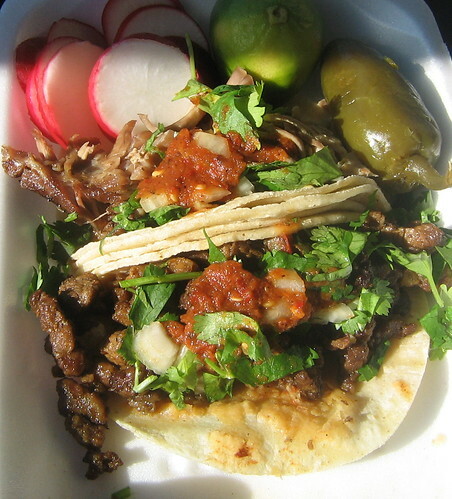 I'm a Mexican expat living in Miami, where a decent taco is extremely hard to find. And yet here I am, reading Bandini's blog and envying his Angeleno whereabouts. How sad is that? I've lived my entire life in LA and it isn't until recently that I've noticed so many places selling Cemitas Poblanas. Maybe it's due to increased immigration from Southern Mexico? All I know is, I like it!